You had in mind the «fertile Palestine» when you chose green, as you have mentioned before. Were there other instances with similar communication problems. 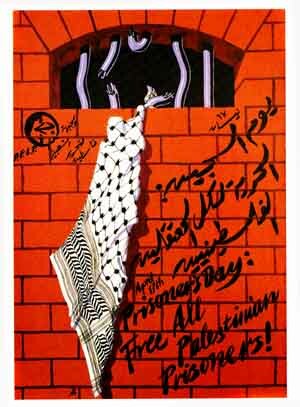 One problem was that the posters had to be designed to be posted in the camps, in its narrow alleys, in Palestinian homes. But they were also to be used for information campaigns abroad. You had to compromise with regard to using symbols as well as with regard to the text. 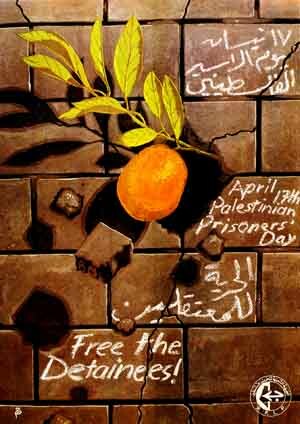 Lets have a look at the symbols: on one of the posters I have drawn a wall with a whole in it in the form of Palestine. 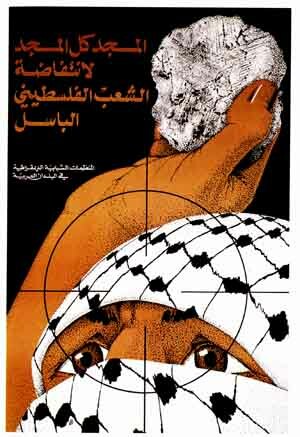 My non-palestinian comrades didn't understand the hint at first sight, but when I asked a fifty year old Palestinian (he later was murdered in the massacre of Sabra and Shatila), who couldn't read or write and was guarding the office, he immediately said with pride, «Falestin». On the other hand some of the Palestinians had difficulties to understand wide angled perspectives. For my work the use of perspectives provided me with the possibility to cope with the manifold demands I had to put up with. I tried to match this problem with a closer realism. I believe the difficulty to perceive strong perspectives has got something to do with the absence of three-dimensional representations in Islamic culture and by this with a stronger development of two-dimensional ornamental representations and writing. Especially calligraphy plays a very important role and even nowadays most of the titles and leads of newspapers are not set in type but written by a calligrapher. This lettering is of course of a much better quality than the often clumsy printing types. For my posters I was working closely with a calligrapher who was working for the «AI Hadaf» newspaper. I learned a lot from him. Some of the lettering I did myself. But it took me ten times as long as when he would have done it. Did you yourself bring the original to the printer and was the printing done as a routine more or less as you wished, or did you have the possibility to be present during the printing process? It was not done just having finished a nice drawing and then placing some sort of a text somewhere on the paper which then got printed somehow. The poster had to be good as a print not only as a rough draught. I put very much stress on the cooperation with the printers. At the beginning this was difficult because of communication problems. My Arabic was not that good at first and the workers in the printing shops or the repro-photographers didn't speak any foreign languages. Very often their shops were also in the «hot» districts close to the «Green Line», which divided East from West Beirut. The chiefs didn't like to let me go there alone. It took me some time to find out how to handle these difficulties. I always felt happy working with the printers or the repro-photographers. When we printed colour by colour, instead of four-colour printing in one go, I was always there and helped mixing the colours. Often I painted or glued proof sheets directly on the films at the reprographers. It was of course a lot cheaper when I did it myself. As well as not doing four-colour printing, because we were in constant lack of money. For example we might have a look at the poster representing the Palestinian friendship with Cuba: the Cuban man waving his hat. You were not tied to your office then, to a world of functionaries, who were only responsible for a small segment of the common cause but screened off from the rest of the world, screened off as well from the entanglements but also from the soberness of the «common» people. They usually feel less and less responsible for the progress of the cause. being in control of the whole process of production. The technical result, reached by simple means, always gave me great satisfaction. (Printing technology in countries of the periphery (Trikont) can not by any means be compared to the one in the centres). This challenge was very tedious in the beginning. But later on I got to like it all the more. I liked working best being in my own room where I had a drawing board and good lights. Very often there were blackouts. So I loved to work during daytime, especially in the early morning hours. Whenever I had to work during the night I had a kerosene lamp which gave quite good light in case of blackouts. In winter this was of no problem, the more so in summer when it was hot already and the lamp added to the heat. Have you also been helping with the distribution of the posters? 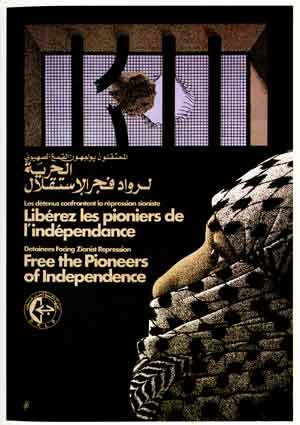 The posters were posted by the Palestinian Youth Organisation called «Shabiba». In the Shabiba the young people of the camps met to discuss or to educate themselves further. They organized football games, chess or ping-pong tournaments. They also had a musical and a singing group, as well as a Dabka dancing group and a brass band. All activities were meant to cherish the cultural heritage of the Palestinians. 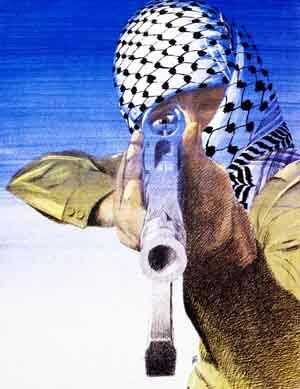 Many fighters and cadres of the Palestinian resistance were recruited from the Shabiba. And I almost forgot to mention it: the Shabiba also organized painting and drawing courses, and exhibitions. This was always done in close cooperation with the graphic artists. A lot of the feedback to my posters, which was very important to me, came through people organized in the Shabiba. In our correspondence you have been using the male gender of the german term for artist. You have done quite many posters for organizations of women, which would be rather out of the question in Western European centres. Are there no female graphic artists ? There was no woman designing posters. There were only a few men anyhow. This might have been the result of the absence of figurative representation in Islamic culture lasting for ages. One of the most beautiful posters of this kind is the one you did for the second congress of the Union of Palestinian Women. 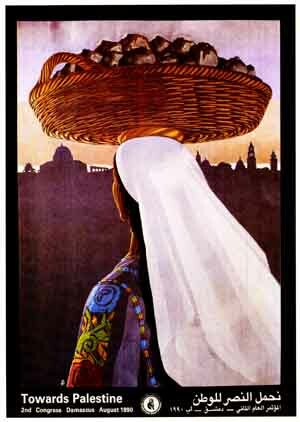 We can see the back of a woman carrying a basket on her head which is filled with stones instead of fruit. She is standing in front of the silhouette of Jerusalem. The traditional role of the woman as the beast of burden and the bread winner of the fighters is subversively turned around - but it is still her who is providing fresh supplies. Also the beauty of the details on her clothes are very impressive. Couldn't this as well consolidate traditional gender roles: women are represented through their appearance, men as being fighters (Kuffiya)? I didn't have in mind the provision of supplies but I wished to show a Palestinian woman collecting stones as ammunition for herself. The embroidery on the clothing is a very important symbol for Palestinian women, which in graphic terms fulfills the need of simple representation. The Kuffiya is in fact not a representative symbol of the women, but only women under arms carry it. Embroidered clothing is common among the women of the camps. The Women's Union itself was always asking me to use it as a symbol. 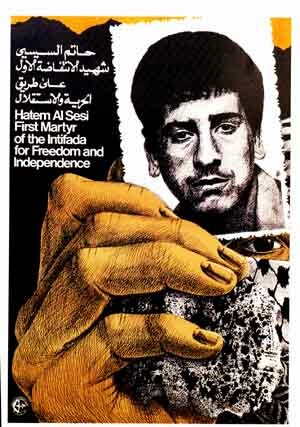 Besides, the poster was especially designed for Palestinian women who should recognize themselves. Adversecriticism shows a too narrow point of view of the European centres. I wish to know your opinion on the discussion going on in Europe about «leftist anti-semitism». It sais that the Star of David is not just the symbol of the state of Israel, of Zionism, but it is also the symbol of the holocaust during World War II. The Star of David was put by Zionists on the flag of their colonialist state. For Palestinians it's the flag of land robbers who drove them out of their homeland. Somehow you've got to name things, why not through the symbol your enemy uses himself. For instance we've never used the «menorah» (seven-armed candelabrum) which Palestinians take as a symbol for Judaism, in contrast to the Star of David which was made the symbol of Zionism by the Zionists themselves. Palestinians have always made a very clear distinction between Judaism and Zionism because they have been moulded in a somewhat peaceful way into an islamic-christian-jewish community living on the same spot of land by the British mandate. Anti-semitism - like Zionism - is a typical European ideology. 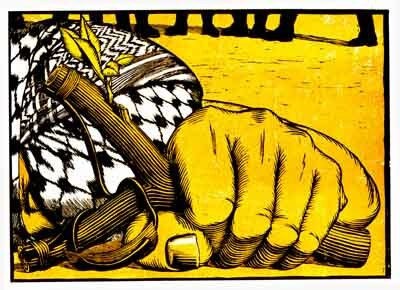 Which policy of the Palestinian resistance was the background of your work as graphic artist during the seventies and the eighties? Most of the Palestinian refugees live in Arab countries. Because most of them didn't have the means to travel far, they live in states with a common border to occupied Palestine, mainly in Jordan, Lebanon and Syria. The relations of the Palestinian resistance movement to the governments of these three countries and to Arab governments in general is a long story of mutual mistrust. On the one hand the movement has got to be present where the Palestinian masses live. On the other hand Arab governments have always tried to instrumentalize the Palestinian resistance movement for their own goals. Over all these years a large section of the movement has learned to work in this field offerees. Of course this has not always been that easy. The civil war in 1970 (Black September) that has been started by the regime of Hussein under guidance of US imperialism led to an open breach with Jordan. Only through the radical democratic power of the masses towards the end of the eighties the movement became again present (over 50% of the population in Jordan are Palestinians). In Syria there was a complete split from 1973 through 1977 between the regime and the Palestinian organizations who rejected the planned Middle East conference in Geneva. The Syrian government had intervened in the Lebanese civil war on demand of the US administration and took sides with the Falange movement. Tal al Za'atar became only possible when the Syrians sealed off the camp from supplies. The Palestinian resistance movement hasn't got its own printing shops because they can be so easily closed down and siezed. Syria had hoped that the US would honour the service it did in Lebanon between 1973 and 1978 with pressure on Israel. But the Camp-David agreement with Egypt was due to be signed. Syria had to realize that it had been decieved. This resulted in a certain radicalization of the Syrian regime after 1978 which led to friendly and military agreements with the USSR. The Palestinian movement had to profit from this new situation without having any illusions on the nature of the regime. A «front of firmness» was built against US and Israeli plans in which apart from Syria, the PLO and other Arab states were taking part. As a consequence the Palestinian resistance became very active in Syria when it was driven out of Lebanon by the Israeli invasion. You were forced to leave bombed out Beirut as well and had to retreat to Damascus. How did this change influence your work? The Syrian regime continued the attempts to instrumentalize the movement according to the political situation with more or less pressure. The Syrian secret services managed to split the Fatah movement and supported Fatah dissident Abu Mussa (1983). In 1986 they managed to instrumentalize the Shiite Amal movement in Lebanon which resulted in the war the Amal forces led against the Palestinian refugee camps of Beirut and Saida. At this period several offices of the Palestinians were closed by the Syrian secret service. It became very difficult to produce printed matters in Syria. Every activity needed a permission which very often was not granted. Often drafts and layouts were seized by the censors and kept back, so nothing could be printed abroad as well. In order to avoid confiscation I had to go downtown Damascus with my posters. There were the photographers who did snapshots of the tourists with polaroid cameras. 1 fixed the poster on a wall and let it take by one of these photographers. Then I sent the pola to the censors. People on street probably thought I was mad, but what the heck, 1 was in a hurry most of the time anyway. The printers as well would not print without a permission. Only few repro-photographers could be found who would still make films (not plates) without permission if we promised that the printing would be done abroad. Usually we ordered two sets of films. One was smuggled into Lebanon where the posters for Lebanon and Syria were printed. The other one went to a Western country where the posters for the international campaigns of information and solidarity were printed. I can imagine that you had the idea of producing coloured woodcuts because of these difficulties. You were able to avoid censure, which had put the printers and photographers under pressure. 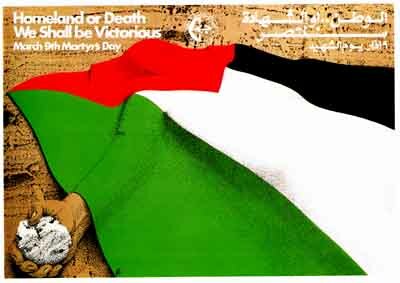 In 1988 the information unit of the PLO in Tunis ordered a series of posters from the various artists of the Palestinian resistance movement that should support the Intifada. I was asked as well. As mentioned above it was very difficult to bring the originals out of Syria. The risk to loose them was always there. If this happened to the repro-film you could make a fresh one. But the information unit wanted to have the original, as repro and print would be done in Tunis. So I had the idea of trying a three-coloured woodcut. If one pattern should get lost I could easily make another one. If you are making woodcuts in Europe you go to a specialized retailer and buy the material and the tools you need. In Damascus I had to go to the merchants who sell wood to the carpenters. I had to run around for quite some time untill I found a good plank of walnut. A carpenter prepared it for me with a worn-out plane. The next question was: how do I get proper knives? In Damascus still live some joiners who sell entire sleeping room furniture with carvings, mostly done in walnut. So I asked one of the joiners where he used to buy his tools. He gave me the address of a downtown retailer. But this one didn't sell them any more, because they were made in Germany and therefore much too expensive. At the end I went to the district with the toolmakers. There I found a little workshop which still had a remaining stock of these German knives. But the tools I bought didn't have a handle. So I had to go to a district at the other end of town where the turners had their workshops. In a printing shop I found a worn-out cylinder that once belonged to a discarded offset printing machine. I also found there printing colours and paper. The printer would not let me pay for it, but he wished to have the first good print instead. 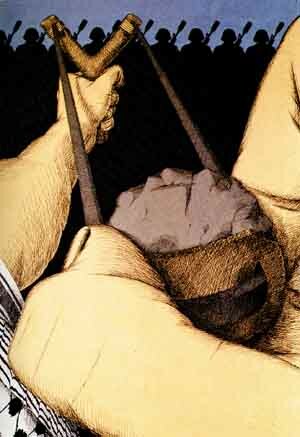 After one week I had together all I needed to start woodcutting (topic: hand with stone, Jerusalem). Because the Syrian government had closed down several offices of the movement it had become quite crowded at my working place with too many people rushing in and out. It v^as almost impossible to concentrate on your work. So I decided to work in my small flat. The printing of 40 through 50 prints in the format of 50cm x 70cm in one go was not that easy. We hung wires across the whole room to dry the prints. Also all the furniture was covered with prints finished already. So we had to sort of wind ourselves through the place. When you do printing by hand you can't avoid using a lot of colour. Because the colour we had was offset printing colour, which is adapted to the paper by the machine in a thin film, it took quite a long time to dry out with our method. We had to stay up late till this had happened. Would there have been the possibility to produce small editions with the technique of woodcutting if the connection to the printers would have been interrupted? It's a pity that this was not possible because we did the posters in three colours with the same block. I first did the carving for the bright colours which we printed. Then, on the same original, I cut the holes for the second somewhat darker colour. We printed this on the first print in glazing technique and so on. Through this technique we achieved different shades of colours on top of one another. On the original finally remain only the cuts for the last and darkest colour. That's why this technique is also called «lost block»-printing. The whole thing was also a question of costs: you only had one block instead of three. I also made careful black prints of each colour in order to make plates for the usual printing of the posters. They were done in colour by colour printing. Only the poster done in Tunis was printed in four-colour technique. But you kept on producing conventional posters? 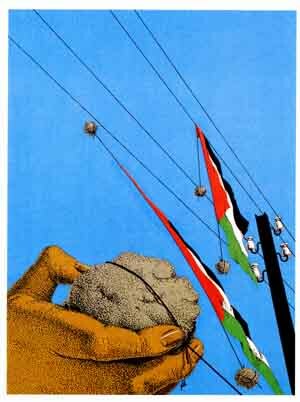 Yes, in summer 1991 for example I was asked to design a poster against the suppression and expulsion of the Palestinians from Kuwait. Because the Syrian government had taken side with the US and its allies in the Gulf war, no Syrian printer could be found to do the poster. The repro-photographers as well were very afraid to cooperate. After running around for some time I found this kind of an eccentric amateur who was working alone and had no employees. He was ready to do it for a small extra price. It was two o'clock in the afternoon with everybody in Damascus at Siesta. He had accepted under the condition that I would fetch the films at four o'clock and pay cash. He didn't want to have «hot stuff» in his shop for long. Usually he would have worked on it for two or three days. Now I had the problem to collect the money at this time of the day with all the shops and offices closed. But everything went allright in the end and the poster was printed in Lebanon. This was the last poster designed for the movement in Syria. Or was it the one for the second congress of the Palestinian Youth Organization? I'm not quite sure any more. It's the poster with the sling drawn in such an audacious perspective that you have the impression of beeing sucked into the poster.